I'm the DAme... the painter half of the artistic duo GTF & the DAme. 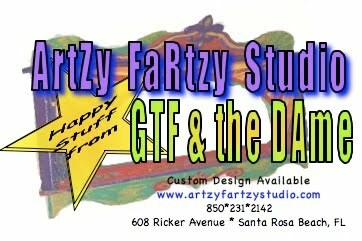 GTF and I co-create happy, sometimes funny, 3D multi-media sculptures. Our artistic process is a back & forth collaboration; often suggested by the unique characteristics of whatever materials we've scrounged up or whatever life maybe tossing our way. No matter what, our work is ALWAYS imbued with our love of laughter, hope, and faith in the divinity of life! Together we dream up design ideas, I sketch & scale the designs, GTF constructs & carves the structural elements, then passes the piece back to me to further enliven with paint and (to his frequent masculine chagrin) bling and cha-cha! We used to design and build houses together before the housing industry went WAY further south than where we live in Florida! Just between you and me... this is lots more fun than building houses! If you like our happy stuff & style we'd love to hear from you! Artzy types are notoriously hungry hams and we're no exception! !